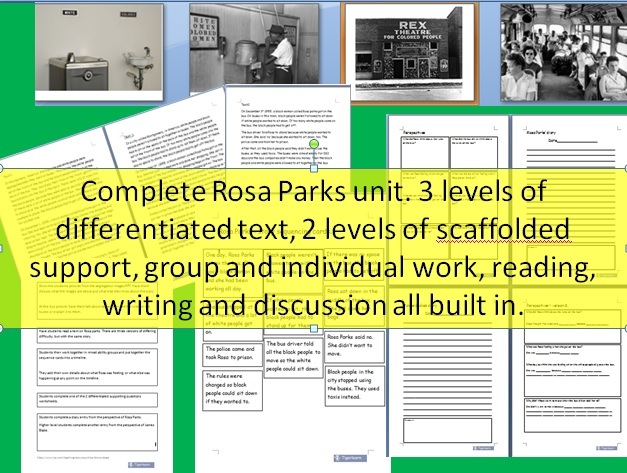 A carefully prepared unit on Rosa Parks and the bus boycott, a great part of a wider civil rights or black history unit. The sequence takes students through the bus boycott story to the writing of a diary from the perspective of Rosa and/or James Blake. Lesson step outline included, story sequencing cards, Images, 3 different levels of text, 2 different scaffolding sheets on perspectives and 2 diary writing pages.